Vitamin D, a fat-soluble vitamin, is essential for homeostasis. Vitamin D is considered a hormone since it meets the basic definition: it can be synthesized in the body, it has specific target tissues, and it doesn't have to be supplied by the diet. Vitamin D is also responsible for maintaining normal blood levels of calcium and phosphorus which are vital for normal neurological function and bone growth. Vitamin D works in concert with other vitamins, minerals and hormones to promote optimal bone mineralization, and to meet many physiological needs, as outlined below. There are two ingested forms of vitamin D -- D3 and D2. Vitamin D3 (cholecalciferol) can be produced in the skin after exposure to ultraviolet-B (UVB) radiation from sunlight, or it can be supplied by the diet. Plants also produce a form of vitamin D called vitamin D2 (or ergocalciferol), which also has activity in people. Both vitamin D3 and D2 are used to fortify foods and dietary supplements in the US. Cholecalciferol (D3) is the preferred form of vitamin D as it can be easily used by the body and doesn’t require additional hydroxylation. Ergocalciferol (D2) is the form added to most functional foods, such as cereals and milk, but requires the additional hydroxylation step by the kidneys and is not as bioavailable. Evidence shows that cholecalciferol (D3) seems to boost blood levels of usable vitamin D for a longer period of time than ergocalciferol (D2), and that D2 is 33% less potent than D3 (Armas LA et al. 2004). D2 (ergocalciferol) is made from yeast, while D3 is made from lanolin or fish oil. There is considerable scientific evidence that 1,25(OH)2D has a variety of effects on immune system function that may enhance innate immunity as well as inhibit the development of autoimmunity (Holick, 2005). Vitamin D in the form of 1,25(OH)2D is a powerful immune system modulator. Pancreatic cells that secrete insulin also express the VDR, or vitamin D receptor. Although the data are limited, clinical studies suggests that suboptimal vitamin D levels may have an adverse effect on insulin secretion and glucose tolerance in individuals with type 2 diabetes (Holick, 2005). Vitamin D is also thought to play a major role in blood pressure regulation. Krause et al. (Krause et al., 1998) reported that hypertensive subjects exposed to UVB and UVA rays from tanning beds experienced a significant increase in circulating vitamin D and a decrease in both systolic and diastolic blood pressure compared to individual exposed to only UVA rays. In cardiovascular patients, deficiency in vitamin D has been linked with an increased risk for heart failure (Zittermann et al., 2003 ). Also, a high incidence of vitamin D deficiency has also been reported in patients with peripheral vascular disease. While it is not fully understood how vitamin D may protect against cardiovascular disease, it is possible that it may be secondary to the role that vitamin D plays in maintaining blood pressure. It is known that 1,25(OH)2D is potently down-regulates the blood pressure hormone renin in the kidneys (Holick, 2005). Additionally, atherosclerosis is considered an inflammatory disease, and vitamin D has been shown to relax smooth muscles in the vascular system (Weishaar & Simpson, 1987). Insufficient vitamin D impairs absorption of calcium. Subsequently, the parathyroid glands increase their production of parathyroid hormone (PTH) to mobilize calcium from the skeleton in order to maintain normal serum ionized calcium levels. In cases of severe vitamin D deficiency, rapidly growing bones fail to mineralize, resulting in rickets. Although the growth-plates continue to enlarge, in the absence of bone mineralization, weight-bearing limbs can bow, resulting in skeletal abnormalities. Although the bones of adults are no longer growing, another medical condition, known as osteomalacia, can occur as a result of severe vitamin D deficiency. Though the fortification of foods with vitamin D (primarily milk) has practically eradicated rickets, there are a large number of children and adults worldwide who are vitamin D insufficient but not to the degree that skeletal or calcium metabolism abnormalities are apparent. Serum 25(OH)D level is the best indicator of vitamin D deficiency and sufficiency, but the cutoff values are debated. Severe deficiency, associated with rickets and osteomalacia, is generally associated with serum 25(OH)D values less than 20-25 nmol/L (Heaney, 2003; Glerup et al., 2000). Although 50 nmol/L has been suggested as the low end of the normal range (Malabanan et al., 1998), more recent research suggests that PTH levels (Chapuy et al., 1997; Thomas et al., 1998) and calcium absorption are not optimized until serum 25(OH)D levels reach approximately 80 nmol/L (Heaney et al., 2003). Very few foods are naturally rich in vitamin D, therefore fortified foods are the most common sources of vitamin D. Although milk is fortified with vitamin D, other dairy products produced from milk, such as cheese and ice cream, are typically not fortified with vitamin D and therefore contain small amounts. Commercially-prepared fortified breakfast cereals generally provide 10-15% of the Daily Value defined for vitamin D. There is also some vitamin D in eggs, organ meats, and certain fish including salmon, sardines, and herring. 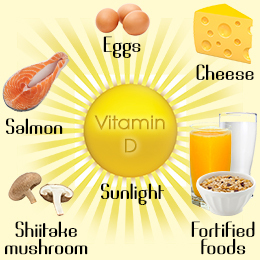 The following table provides a listing of foods that provide vitamin D in varying amounts. It is estimated that over 28 million adults in the United States have, or are at risk of developing low bone density and osteoporosis. Prevention and early intervention is paramount. Osteoporosis is most often associated with inadequate calcium intake, however, a deficiency of vitamin D contributes to the development of osteoporosis due to inadequate calcium and phosphorus absorption. While rickets and osteomalacia are extreme examples of vitamin D deficiency, osteopororsis is an example of a long-term effect of vitamin D deficiency. Adequate storage levels of vitamin D help keep bones strong and may help prevent osteoporosis in older individuals, non-ambulatory individuals (those who have difficulty walking and exercising), post-menopausal women, and individuals on chronic steroid and antiepileptic therapies. Sufficient vitamin D intake is also associated with a reduction in falls (Graafsman et al., 1996). Vitamin D supplementation for the prevention and management of osteoporosis is considered an effective public health benefits due to its low costs, excellent tolerance, and overall health benefits. Laboratory, animal, and epidemiologic evidence suggests that vitamin D may be protective against some cancers. Epidemiologic studies suggest that a higher dietary intake of calcium and vitamin D, and/or sunlight-induced vitamin D synthesis, can correlate with lower incidence of cancer. In fact, for over 60 years researchers have observed an inverse association between sun exposure and cancer mortality, however, it wasn’t until the late 1980s that Garland and colleagues found that the mortality rate associated with colon cancer was higher in the Northeastern US compared to southern states (Garland et al., 1985). A wealth of accumulated data reveals that the risk of developing and dying of breast, colon, esophageal, non-Hodgkin’s Lymphoma, ovarian, and prostate cancers is associated with living at higher latitudes, associated with a greater risk for vitamin D deficiency (Holick, 2005; Hanchette & Schwartz, 1992; Grant, 2002). A meta-analysis showed reduction of cancer risk by up to 50% (for colon, breast, prostate and ovarian cancer) with adequate vitamin D intake and levels (Garland CF et al. 2006). Alzheimer's disease has been associated with an increased risk of hip fractures. This is likely linked to the fact that many Alzheimer's patients are older, homebound, and exposed less to sunlight. With aging, less vitamin D is converted to its active form. One study, which included elderly women with Alzheimer's disease, found that decreased bone mineral density was associated with a low intake of vitamin D and inadequate exposure to sunlight (Sato et al., 2005). However, with regular sunlight exposure and calcium supplements, bone mineral density increased by 2.7% and serum 25(OH)D levels increased from 24 nmol/L to 52 (Sato et al., 2005). The need for vitamin D supplementation should be part of an overall treatment plan for those with Alzheimer's disease. Components of the immune system, including macrophages, monocytes, and T and B lymphocytes, also have a VDR, thereby allowing vitamin D to have an impact on regulating cytokine synthesis, monocyte maturation, macrophage activity, and more (Holick, 2005). The risk of developing Type 1 diabetes and multiple sclerosis (MS) was significantly reduced or prevented in animals receiving vitamin D. Reportedly, living at a latitude greater than 37° increases the risk of developing MS >100% during one's lifetime (Holick, 2005). The risk for both MS and rheumatoid arthritis was decreased by ~40% in women taking a multi-vitamin supplement with as little as 400 I.U. of vitamin D (Holick, 2005). Other studies have shown a role for vitamin D in modulating the immune system via regulation of T helper cell and dendritic cell function, with reduced risk of multiple sclerosis and rheumatoid arthritis with adequate vitamin D intake (Munger KL et al. 2004; Cantorna MT, Mahon BD 2004).